Snow and sunshine. Good and evil. Magic and enchantment. Whatever the weather, in Fairyland there’s always a magical time ahead… Naughty Jack Frost promised not to trouble the Rainbow Fairies again, but he didn’t say anything about the Weather Fairies! Now he’s stolen the feathers from the weather-vane cockerel in charge of the weather – which means Rachel and Kirsty will have to get them back! My favourite is Evie the mist fairy. I really enjoyed reading all of the books. I think the books should be for girls 5-8. 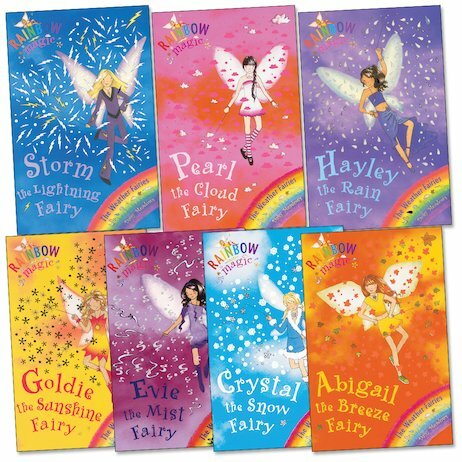 The book I liked the most was Abigail the breezz fairy. Rachel and Kirsty help the fairies to get the weather feathers back to the cockerel. Jack frost has now taken the feathers from the special weather vane cockerel and now Rachel and Kirsty have to get them back. This book was really good espeishley Goldie the sunshine fairy I hope you like it to. I got these when I went to Brownies they are lovely storeies to read and all my friends love looking for their names too. They are simple stories with a good ending which is always good and not sad. Jack frost Gobblins has stole 7 of the weather vane name Doodle feather and the Queen and the King asked Rachel to help Crystal the snow fairy, Abigail the Breeze fairy, Pearl and the cloud fairy, Goldie the sunshine fairy, Evie the mist fairy, Storm the lighting fairy, and Hayley the rain fairy. my name is nonou i would like to read them. i willlllllllll read those books some day. i really enjoyed the other books and now i will like to read the other chapters. The Weather Fairies lost their feathers, thanks to the goblins. Now the weather in the human world and Fairyland is wacky! Can Rachel and Kirsty get the feathers back?